Honey, Not In Front of the Kids! Couldn't resist putting up a photo of this set of Incredibles PVC minatures now available from The Disney Store. We didn't do anything to produce this particular alignment of Elasti-Girl's hands and Mr. Incredible's...well, you know. Even their facial expressions seem to fit the tableau of their packaging: he's blushing, she has a kind of lustful, playful smile. We looked at the packages and I'd say about half of them, at least, look something roughly like this. 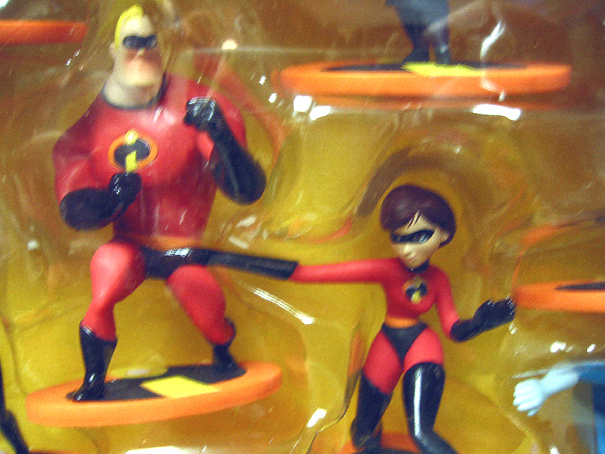 On the rest, Elasti-Girl's hand is pointing at Mr. Incredible's knee. The movie, by the way, is possibly the best I've seen all year, and easily my favorite of Pixar's entire oeuvre. It's not just funny, but also passionately invested in the things that it cares about. It's completely authentic about its passions. As long as I'm on the subject of fun rather than my dreary post-election ramblings, I also played a goodly bit of Half-Life 2 over the weekend. Anyone interested in computer graphics at least needs to see the game in action. It comes the closest of any game I've seen in terms of climbing out of the "uncanny valley" of representations of humans--the faces are eerily life-like, never looking that plastic-CG way. So are the environments. Everything has a physics to it--you can pick up any loose object and throw it. This only makes me feel the same way that the first Half-Life did. There's another "uncanny valley" here. The more it strives for visual realism, the more that the narrative and representational conventions of the first-person shooter become noxious. Every once in a while, I felt like the action of Half-Life 2 and my emotional experience of its frightfully realistic simulated world became simultaneous, and that was an amazing sensation. I'd feel panic, scramble through an environment desperately like a hunted man, feeling I was Winston Smith Gordon Freeman in a dystopic world, rather than a jaded gamer who knows how to methodically explore the movement space of a FPS. But then the first time you die and have to repeat a sequence, you find yourself saying, "Eh. Why can't I climb that chain-link fence? I can do all this other stuff," or "Why are those guards just sitting up there with a rocket launcher waiting for me when I come back this way ten minutes later when they have no reason to expect that I will?" At one point, I left a sort of hovercraft behind at a burning barricade because I thought there was no way through for it. I made it on foot to a point on the map where I could go no further without dying, either from a helicopter shooting me or toxic waste in a tunnel. Finally, I went to look at a walkthrough and found out that I still needed the hovercraft and that there was a ramp at the barricade. The immersive magic of the world sort of faded at that point. Grand Theft Auto: San Andreas mostly gets right what Half-Life 2 gets wrong--it still has the wide open world that the other GTAs did (with a few obnoxious missions that have to be completed in one way and one way only). If only we could squeeze these two together: HL2's astonishing visual realism in a world where you don't have to be a train car riding down the tracks.